Contemporary technological inventions like escalators make life comfortable. However, the other side of the medal is that more and more people have an inactive lifestyle. 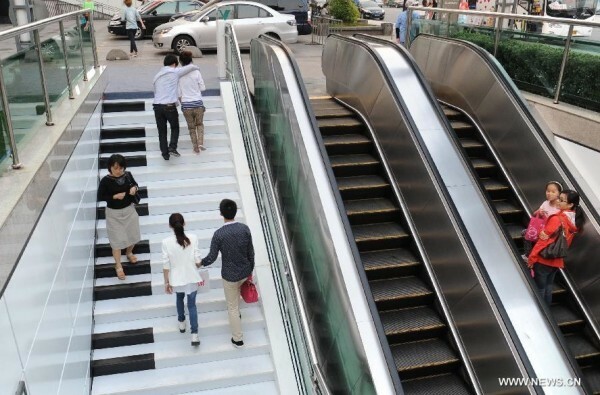 The piano stairs are a successful example of gamification in a city in order to stimulate an active lifestyle. Most of the piano stairs create tones when you step on the stairs. This creates the opportunity to climb the stairs while being rewarded with the music which you create together with the other stair climbers. The piano stairs are successful because they are fun. The results of the piano stairs are clearly positive. Research has shown that 66 percent of the people who can choose between taking the stairs or riding the escalator, take the stairs more often if they are piano stairs. The challenge for cities is to implement measures which are good for health but the measures should also be fun, especially when they are focused on children.